Stuffing is one of the higher fat culprits sitting on your Thanksgiving dinner table because of all the oil that drips into it from inside the turkey. 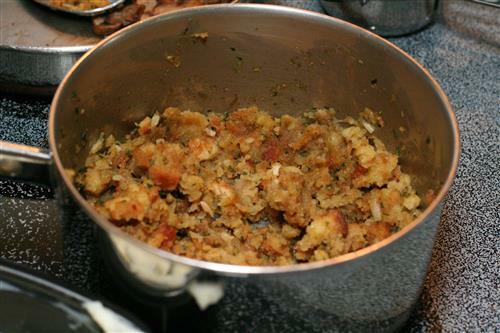 To help keep this under control, consider swapping out your traditional stuffing and preparing a rice stuffing instead outside of the turkey. The following recipe is much lower in fat and offers a nice blend of flavors. First combine the fruit and juice together and then place either in the microwave or in a small pot on high heat until hot. Heat olive oil in a pan until hot and then toss in the nuts, stirring slightly until they have taken on a crisp texture. In another saucepan, heat chicken broth. Once hot, add in onion, celery, and garlic gloves until tender. Stir in wild rice along with five cups of water and bring to a boil. Once boiling, cover and cook over very low heat for about 25 minutes or until rice is finished and water is absorbed.